The Hunter Valley is the birth place of Shiraz in Australia, the styles produced here are very unique to our region. Hunter shiraz is proudly medium bodied, with a distinctively savoury structure and food friendly texture. An inwardly concentrated core ensures the best examples of Hunter Shiraz have amazing long term cellaring potential. 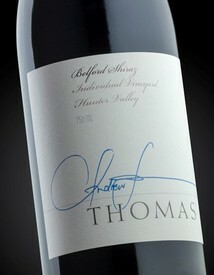 The inaugural vintage release of a new single vineyard Shiraz from the Belford sub-region of the Hunter Valley. Great intensity in the blue/dark fruit spectrum. Exclusive to Thomas Wines Club members. A barrel selected blend from the Sweetwater, Kiss, Belford and Dam Block vineyards. Satiny texture and blue fruited, but with an underlying grunt of concentrated fruit and 'punchy' premium French oak. Our flagship single vineyard Shiraz has become a modern benchmark the for Hunter Valley. It clearly demonstrates that Hunter Shiraz can achieve amazing intensity and concentration within a medium bodied frame.